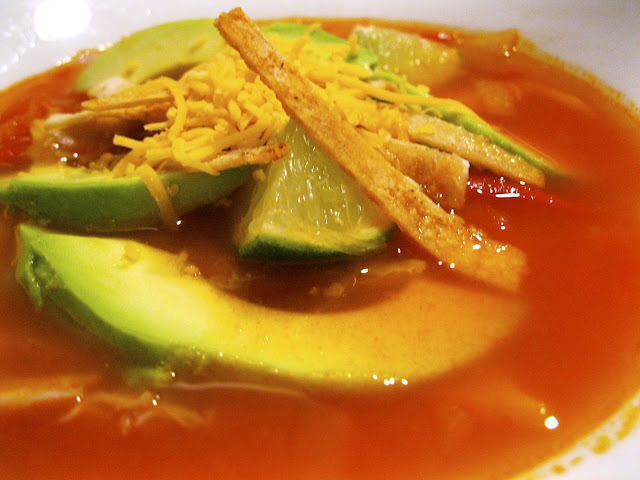 Mexican Tortilla Soup shines in the realm of great chicken soups. It is the ultimate body warming dish with a hot, steaming broth and spicy, zesty accents. The addition of creamy avocado slices, melted cheese, lime, and crispy tortilla strips creates a fun layering of flavors and textures. While featured on many Tex-Mex menus, the simmering bowl can also be easily assembled at home. We were first introduced to the dish while visiting our best friend, Kimmy in college. Spending four years at neighboring schools in snowy Upstate New York, we often experimented with different soup recipes to offset the chill outside. With a big bowl on a brisk Sunday afternoon, you’ll be ready for a siesta. Heat 1 T EVOO over medium-high heat. Add onions and cook for 3-5 minute, until translucent. Add garlic and cook for 2 more minutes. Add tomato paste, canned diced tomatoes (with liquid), jalapeños, chili powder, salt and pepper. Cook until liquid evaporates, about 2-3 minutes. Add broth, bring to a boil, then reduce heat to low. Let simmer atop the stove for at least 30 minutes to let the flavors meld. Have fun with the toppings-we sometimes add corn, black beans, or a spoonful of sour cream. Our version is pretty spicy, so feel free to reduce or increase the seasoning to taste.